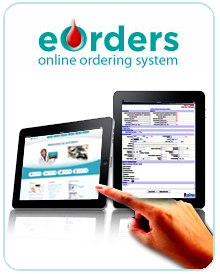 eOrders is a web based, online ordering system for use in blood banks, laboratories and hospitals to order blood, blood-tests and related products and services. The system can be local to the blood banks, laboratories, hospitals and pharmacies or hosted in the cloud. Buyers and sellers connect securely through the internet to transact business. Options to do business by way of telephone fax and emails are included. In this way the final status of all orders are available in real time. Orders submitted are acknowledged within agreed time period by an automated feedback process. Authorized users can check status of orders, shipments, expected delivery, fill rates and management reports online anytime, from anywhere. The system provides an electronic two-way communications on each other home pages. It also provides an online chat service for buyers and sellers to connect in real time to ask questions or seek help. Internet transmissions are secured and encrypted over SSL (secured socket layer). This allows safe and secured completion of orders remotely. Completed orders are stored in local servers or in the cloud, allowing authorized users access to them online.